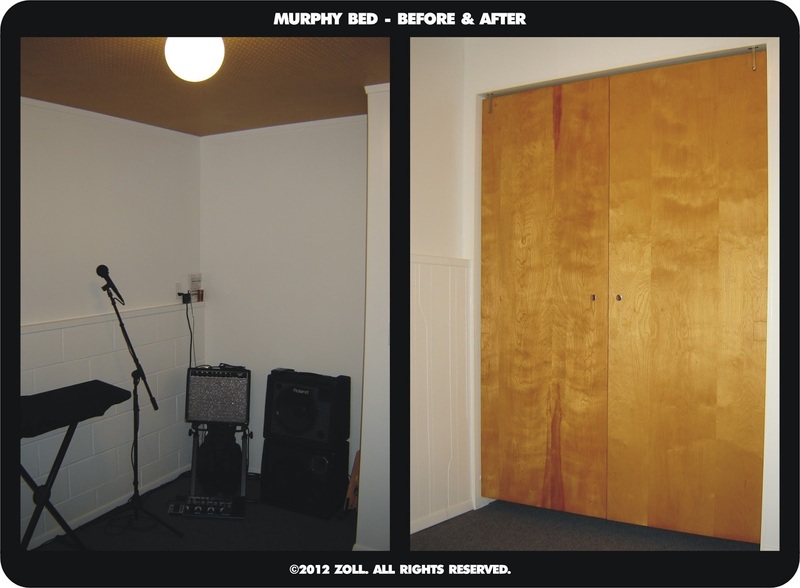 Ever since I was a little kid, I wanted a Murphy bed, but never thought I would have the opportunity to own one. Fulfilling wacky desires, and doing whatever the hell I want, is one of the reasons I became a homeowner. Our 1970's basement included a strange offset space, presumably to be finished as an additional bedroom. During the renovation, it made sense to connect the existing walls and install a door. Doing this created a nook inside the new bedroom. Sketches of bookcases and additional shelving did not satisfy the needs for this odd space. After measuring a full size mattress, I realized that I might be able to slide a guest bed frame into the space. This was the start of my journey to design and build a wall bed. As with all my projects, I started with a fair amount of research and was convinced that I needed a kit in order to make this happen. The alcove is tight and I would end up having to do a significant amount of modification to an expensive purchase. I let my wheels turn for a few weeks and decided that I could simplify the basic components. My design does not have springs and does not automatically return to an upright position. For safety reasons, you would have to consider the risk of a falling bed and personal injury. I feel comfortable with the two slide-bolts that keep the bed in the vertical position when not in use. The essential part of my idea would be a pivot consisting of two different diameter pipes nested inside of each other. I found a 1-1/4" steel conduit insert that would act as a pivot bushing on the inside of the bed platform. This allowed for a standard 3/4" stub to be inserted inside the bushing and mounted to the wall with a floor flange. Initially the pipes nested too tightly, but with a little polishing, the pieces move smoothly without lubrication. The next issue was building a lightweight platform bed that was strong enough to support the mattress and two adults. I also had to consider the aesthetic issue of matching the existing vintage maple door color and finish. Fortunately, we have a well stocked Habitat Re:Store that carries plenty of used doors from the 1970's. I was able to purchase two hollow-core doors that matched the rest of our house. I opened up the ends of the doors and drove carriage bolts through the spine in order to create a central support. I then milled 1" x 4" dimensional lumber as bed rails and a 1" x 10" board for the headboard. This is critical because the mattress rests on the headboard in the vertical position. The finishing touches involved a luggage strap bolted to the frame and two removable legs that can be unscrewed from brass inserts in the upper corners. This has been one of the hardest projects to document because our third bedroom is small and I have not been able to photograph the Murphy bed properly to do it justice. Wall beds are awesome space-savers that can store a mattress in a room that is used by guests for only a couple weeks, and frees up the square footage the rest of the year . Is there a way that you could post some more detailed pics of this project? In response to Anonymous, I am not sure what details you are interested in seeing. The bedroom is quite small and the project was difficult to document. Feel free to email me if you have any further questions.